The importance of orthopaedic surgery is increasing day by day due to higher rate of road traffic accidents and interpersonal violence. Also diseases of bones are on the rise because of impaired nutritional status, lifestyle diseases and larger geriatric population due to higher life expectancy. The faculty of this department specializes in all different orthopaedic streams. 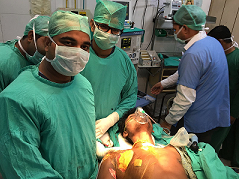 The treatment modalities of this department are a blend of both traditional conservative approach as well as modern operative techniques. The Department of Orthopaedic surgery is a fully developed department with all the infrastructure and support services as recommended by the MCI. The Dept. has committed full time faculty; highly trained, dedicated and experienced Orthopaedic specialists qualified from prestigious medical colleges of India with versatile skills. Our department is an excellent and harmonious amalgamation of youth, exuberance, experience and ambition which has grown up as the largest department in UP. With the committed bed strength of 90 with additional beds in emergency ward and SICU, the service caters to all facets of Orthopaedic discipline, besides being a high standard tertiary referral centre for highway trauma. Our Orthopaedic surgeons have diverse expertise and are committed to provide effective solutions for children and adults with a wide range of Orthopaedic problems from broken bones to spinal disorders, from crippling arthritis to sports injuries. Apart from high standard clinical and surgical care, our department is pioneering high quality research, documentation and organization of academic meetings and courses. 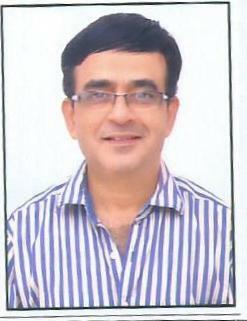 Our faculty members are involved in editorship of International Journals and training programmes. The faculty has academic affiliations with prestigious international societies. They attend and also present papers in prestigious international and national academic meetings regularly. The departmental mission is to provide highest quality patient care, improve mobility and enhance the quality of life for all and to impart highest quality medical education in Orthopaedics to the undergraduate students and inculcating in them a sense of academic and clinical fulfilment and confidence. The principles of recognition of skeletal trauma. The suitable methods to detect and manage common infections of bones and joints. 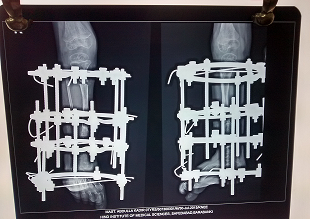 The intricacies of congenital, skeletal anomalies and their appropriate correction or rehabilitation. Metabolic bone diseases as seen in this country. 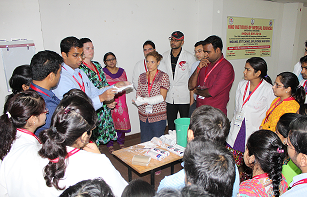 At the end of the course, the student shall be able to effectively manage skeletal trauma, treat osteoarticular infections, manage arthritic and congenital disorders by conservative or operative methods. Be able to apply their Orthopaedic training to provide sound treatment of skeletal and related conditions at primary or secondary health care level. Our teaching is regularly integrated with Anatomy, Physiology, Biochemistry, Surgery, Pathology, Radiology and Forensic Medicine subjects. Sonography as an Objective Tool in Monitoring Serial Corrections and Detecting Spurious Corrections in Club Foot. Mid Shaft Clavicular Fracture- A Retrospective, Randomised Study of Comparison of Outcomes Between TENS Nailing & Conservative Treatment. Comparative evaluation of result of percutaneous cross k-wire versus two lateral k-wire fixation in type-III supracondylar fracture humerus in children. Evaluation of Results of Closed Elastic Nailing in Fracture Long Bones of Children. Internal fixation of displaced middle third fracture of clavicle with precontured locking plate. MBBS theory lectures taken by the faculty regularly. IPD teaching in morning and evening. Regular CMEs and Workshops conducted by the department. Periodic rural camps for the benefit of outreach patient.